To access the Log Monitor page, you use the log monitor button on the header navigation bar. In the ‘User Preferences’, there is a Log Monitor Page Preference that allows you to reverse the order that the log lines are shown. Clicking on the ‘+’ button will open the Add Log Monitor modal window which contains a form that allows you to register an Adapter to the UI. Name: This property is for display purposes and also an easy way to differentiate Log Monitors registered within the UI web application. Interlok Instance: This is the name of the Adapter instance you want to monitor. Appender Name: This is the name of the configured Jmx appender, one or more appenders can be configured in the log4j2.xml file. Max Statements: This is the number of log statements the web console will keep in memory. Too much will slow down the page and too little may not give enough information. The default is 200. Refresh Interval: This property is only used if your browser doesn’t support Server-sent events (SSE) and a polyfill could not be applied. However all modern browsers should work with SSE. Once the new Log monitor has been saved the console should start showing logs (if some logs are generated by the Adapter). Note: If the logging widget isn’t available, you will have to configure jmx logging within the container config. As well as log4j config, you would have to put the interlok-logging.jar into the containers lib folder. 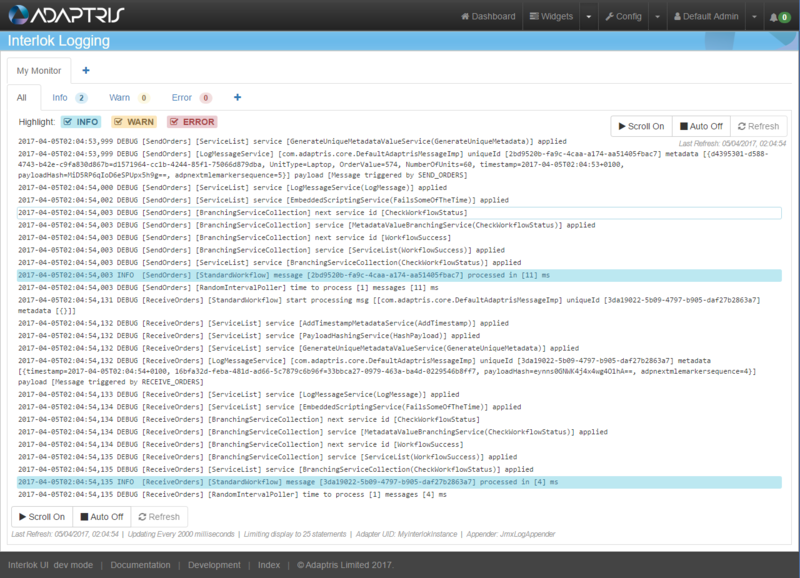 Scroll On/Off Turn on or off the auto scrolling of the console to follow the new log statements. Auto On/Off Turn on or off the auto refresh. If turn off no new log statements will be added to the console. Refresh Refresh the console (This button is only used if your browser doesn’t support Server-sent events (SSE). 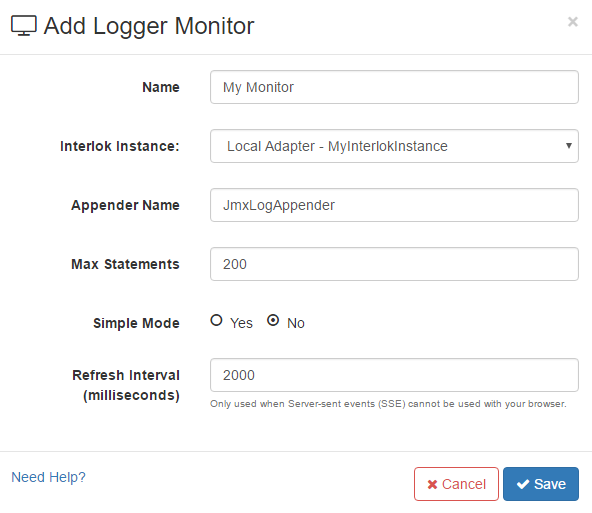 All: Display all the logs from the jmx appender. This sub-tab as highlighters to make info, warn and error logs stand out. Info: Only display info logs. Warn: Only display warning logs. Error: Only display error logs. You can also add a customise sub-tab by clicking on the ‘+’ button on the right-hand side of the Error sub-tab. 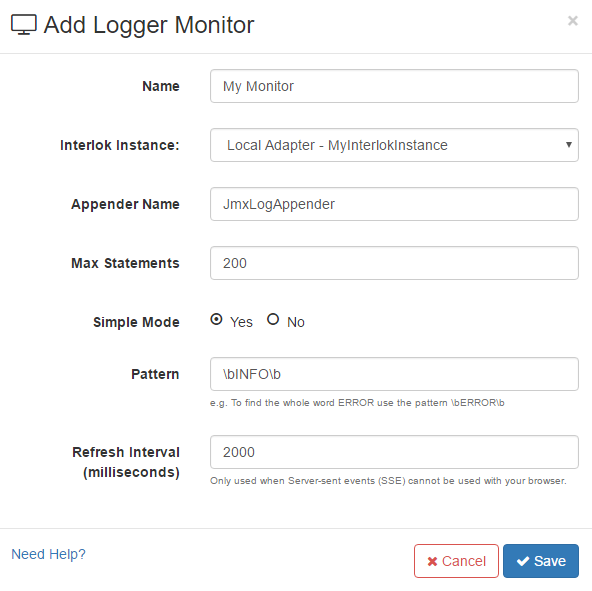 Clicking on the ‘+’ button will open the Add Log Monitor Filter modal window which contains a form that allows you to register a new Filter to the Log Monitor. Name: This property is for display purposes and also an easy way to differentiate Filters registered within the Log Monitor. RexExp Pattern: This is the regular expression used to match log statements with this filter. For instance, if you want to display only logs for the ProductLookup Workflow you can use .*\[ProductLookup\].*. You can find more help on regular expression. Once the new filter has been saved it will be automatically selected. Tip: You can drag and drop sub filter tabs to reorganise them. (Since 3.5.0).